Goulash Fest 2015 - Early Birds! 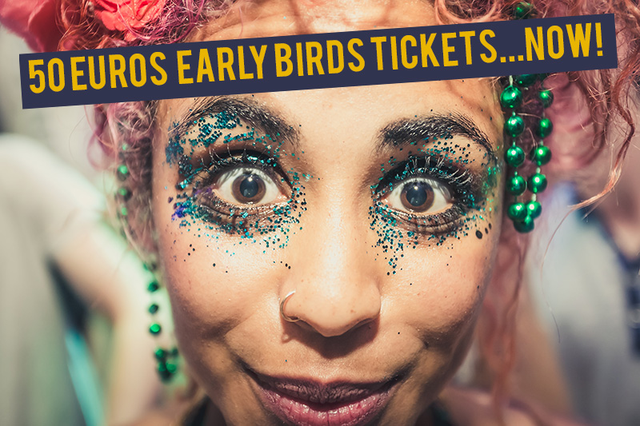 50€ Early birds are ticket are available, but not for long! Thanks for your early support, you made it happen the first time and we hope to see you in our new wicked venue this summer!! First we need to thank you all for the support and enthusiasm from all parts towards the festival! We've raised more than 6000€ already, and therefore started booking dj's, musicians and performers of all kinds! ​Creative producer and energetic live performer, Mayd Hubb is an atypical artist on the international dub scene. Nocturnal compositor, he elaborates a conscious and intimate music toasted with many influences (roots reggae, dub, hip hop, electro, ethnic music) and mainly inspired by the notion of travel. One of the most active DJ, Producer and Blogger focussed on Electro Swing and Global Beats based in Germany, Sound Nomaden is a pioneer in mixing Swing, Jazz and World with House and Tech-Beats, making every crowd getting totally crazy to his positive sound. Jinx in Dub is widely regarded as the one of the UK's top rankin Dubwise breaks producers. A consummate Breakbeat, Jungle and Dub producer, his consistent bounce-power and bass prowess have been smashing up clubs and major festivals in the UK and abroad. Savages & Suefo are two DJs/producers who came from the same eclectic music scene in Budapest. 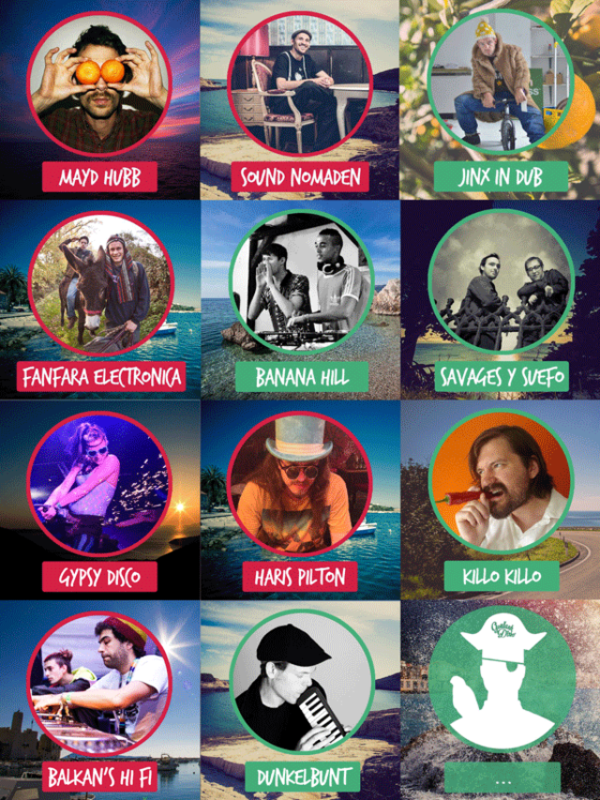 They play downtempo, breaks, jazz, funk, hip-hop, swing, dub and all kind of multikulti folk in their DJ sets. Fanfara Electronica is a global music cocktail mixed, remixed, boosted, edited and transformed to take everything the world's cultures have to offer you with great shots of bass. Banana Hill started as a successful radio show that morphed into a clubnight. Goulash will welcome their resident DJs who play a flamboyant crossover of traditional African and Latin American sounds with Global Electronica, including Highlife, Afro-house, Afrobeat, Disco, Latin Rare Groove, Kwaito and more. Balkan's Hi Fi plays a unique mash-up of all sub-genres of reggae and bass music. Flagship of the reggae scene in former Yugoslavia, Balkan's released the first Balkan Reggae compilation, “Balkanfarraj”, and represents the scene in major music festival accross the world. The wizzard is back! Timelessly dancing through countries and continents, searching for the infinite beauty of the music and sharing its magic with you Goulash people! An euphoric party featuring fire-breathers and belly dancers, circus performers and interactive theatre. Take off your clothes, paint your face and prepare for a night that you probably won't remember! Dj/mc specialized in balkan, tropical, and world-beats, full of drunken dances, genious singing and toasting skills during his dj performance. Haris Pilton is pushing forward the whole Balkan/Dub/Electronic scene, compulsively producing and helping others releasing tracks on his record labels. So, stay tuned for the next names, and please share the news with like minded people who would enjoy a week of Goulash at the beach! 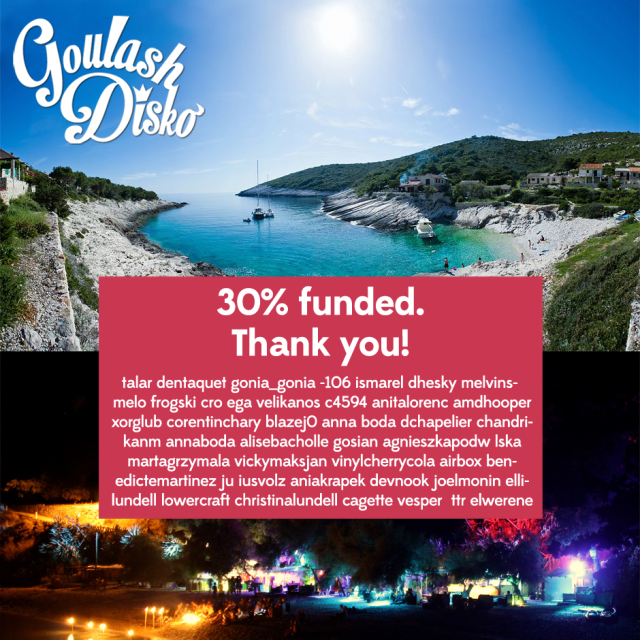 Only 3 days have passed since the launch of our campaign, and you already funded more than 30%!Big thanks to the 46 people who donated, but also all the dj's, bands and artists who contacted us to perform at the festival. At this point, all super early birds tickets are gone, but there are 30 early birds tickets left, so if you know people willing to come, please spread the word!